Despite hitting a setback in sales volume due to winter weather recently, the midsize sedan market is a hot segment. Consider the competition: Accord, Camry, Fusion, Malibu and Avenger. 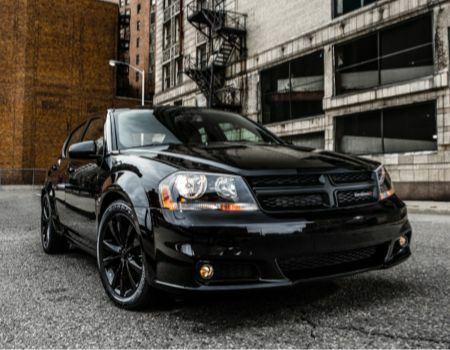 In an attempt to make its car more populous in driveways than rental fleet lots, Dodge offers special edition Avengers such as this 2014 Dodge Avenger Blacktop. 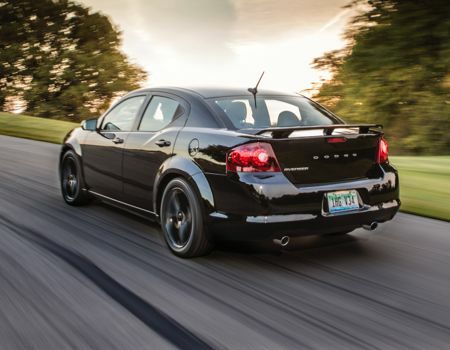 Dodge starts with the basic platform that is shared with the likes of Chrysler 200 and certain Mitsubishi models and adds some nice appointments (and heavy corporate Fiat influence) to make Avenger a somewhat more desirable vehicle. Thanks to the recent upgrades to interior packaging and materials and the new corporate Pentastar 3.6-liter V-6 engine, the Avenger is no longer a punishment to drive. Sure, the underpinnings still scream Chrysler Group but there is hope from the new Fiat Chrysler Automobiles and in the near future we should learn if Avenger is headed for automotive archives or if other rumors come true and we see an all-new Avenger that sees a new rear-wheel drive platform. As for the 2014 Avenger Blacktop, this is how one dresses up an otherwise milquetoast midsize sedan complete with some nice gloss black 18-inch rims, blacked-out grille and trim and a rear spoiler. Inside, our Blacktop tester was outfitted in SXT trim which means leather appointments all around in an interior that recently went from “hated it” to “love it” on its last makeover. The 2014 Avenger offers the latest technology from FCA including Uconnect drivers services, 40GB hard drive infotainment system with 6.5-inch touch screen display, SiriusXM Travel Link, Bluetooth connectivity and Garmin navigation system. As I mentioned previously, the Avenger Blacktop arrives with the 3.6-liter V-6 engine producing 283hp and 260 lb. ft. torque and is backed by six-speed automatic gearbox. Fuel economy ratings come in at 19 mpg city and 29 mpg highway. The vehicle is front-wheel drive and offers a full host of safety and driving technologies and is an IIHS Top Safety Pick Plus. On the road the car is well mannered while offering a quiet and comfortable driving experience however at times there seemed to be a little front-to-rear bounce that I attribute to the larger wheels and tires. Not overly disconcerting, just something more noticeable than in competitive models. 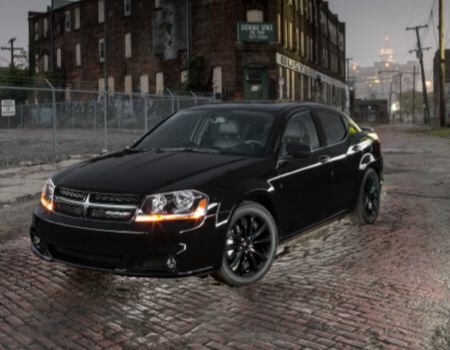 Pricing for the 2014 Dodge Avenger SXT begins at $23,295 and this loaded Blacktop edition arrives with a final sticker of $26,480. Dodge has come a long way with Avenger in recent years thanks to heavy Fiat oversight and in the not too distant future we should learn the fate of the model with hopes it will return as perhaps, say, the next Barracuda? Hmm.